So, I promised a funny story yesterday...and that didn't happen exactly as planned. But, I hear that this story of mine did get told at a certain Bunco Party last night. Clearly, everyone is well aware of this Ebola scare.. And, while we don't (yet) have a bunch of cases (only 8 at the moment...and I didn't even know it was that many. I thought it was, like, 2 or something) here in the US, hearing the news is just NOT FUN. But it is funny (afterwards) for those that freak out in Target. I'm in the checkout line at Target the other night. By myself. And, free to think whatever without the interruption of little voices. Y'all. Do you EVEN know how wonderful that is? Mamas know. Others? Not so sure they quite get it. Maybe one day. But, it is awesome. The cashier was asking where this girl was from because of the 1) non-Alabama accent and 2) the non-American accent. She says, "Sweeden. I'm here for school." The guy with her said he was showing her around. Now, why he would bring her to a Target in a suburb NORTH of Birmingham, I haven't the slightest idea... But, that's not the point. I'm sure the security camera guys were laughing because my eyes got really big really fast. All of a sudden I just started thinking, "Oh my gosh, when did she get here?" "How long has she been here?" "Did she fly through Dallas?" "Probably Atlanta." "Dumb airpot...wait...what about the people on the airplane??" "Where were they from?" "Did she touch anything that I could have touched?" "Stupid Target!" "Stupid Ebola." "I'm never watching the news again!" Yes, I went insane...for about an hour. I sanitized my hands as soon as I got to the van. Because we all know that hand-sanitizer cures everything, dork. I got home and washed my hands about 80x and ran to Jason, who was on the phone with his Dad. Sweet. He took one look at me and my "I just saw death" face and as, "What's the matter with you? Are you ok?" 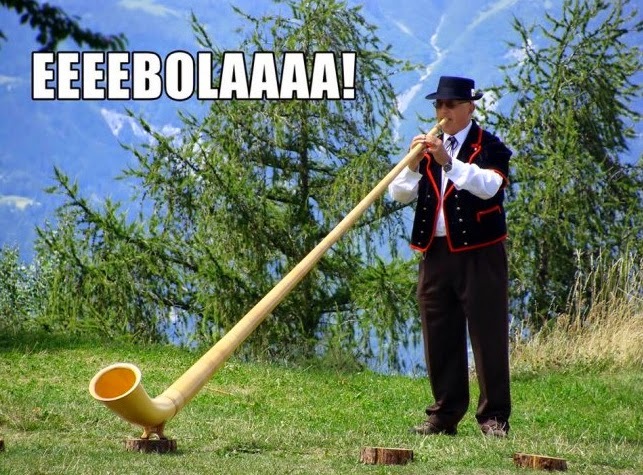 I say, "E. E. E. Ebola! How do you get it?!" He rolls his eyes and hands me the phone, "Here. Talk to my Dad." Y'all. This was my greatest moment. Maybe this is why I need these little people in my life...to keep me from actually going completely insane. Where's the wine? Is it 5 o'clock yet?